Winship's head pharmacist R. Donald Harvey, PharmD, presented education session on cancer biosimilars at ASCO annual meeting. 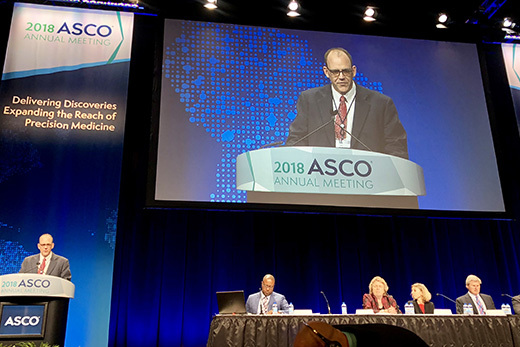 R. Donald Harvey, PharmD, director of the Winship Phase I Clinical Trials Section, presented an education session on the emergence of cancer biosimilar drugs at the American Society of Clinical Oncology (ASCO) annual meeting in Chicago. Harvey is co-author of an article published May 24 in the New England Journal of Medicine (NEJM) about the growing availability of biosimilar drugs, their potential cost-savings, and how they can be safely used in clinic. The ASCO session is part of the organization's outreach to educate oncologists about biosimilars. ASCO recently issued a statement and guidelines addressing the assessment of safety and efficacy of biosimilars and their integration into clinical practice. "The first biosimilars to treat cancer have been approved by the U.S. Food and Drug Administration (FDA) and are likely to be available soon. As pharmacists, we will review all information for use with patients at Winship, including safety, efficacy, and cost considerations, for this new class of biologic agents," says Harvey. Like generic versions of chemically synthesized drugs, biosimilar medications offer potential cost savings if they can be safely and efficiently substituted for the patented biologic therapies. Biologic drugs are produced with the use of living organisms and include some of the most recent immunotherapy agents transforming cancer treatment. These complex therapeutic proteins, such as cytokines and monoclonal antibodies, are difficult to replicate and more expensive to produce than chemically synthesized drugs, so there is enormous interest in developing successful biosimilars. The NEJM article states that the biologic oncology products expected to lose patent protection by 2020 "account for more than $20 billion in global annual spending." The article looks at the complexity of producing biologic therapies and the inherent difficulty of creating biosimilar products, pointing out that even after approval by the FDA, companies face challenges in manufacturing the drugs and bringing them to market. The authors also identify challenges in the acceptance of biosimilars by both physicians and patients and the need to educate physicians on how to assess their interchangeability with originator drugs. Dr. Harvey was also a discussant on "The Science and Process for Biosimilars," a Clinical Science Symposium session presented earlier in the day at ASCO.